Soph is a big fan of madeleines, so I got here a madeleine tray for xmas so we can make our own. 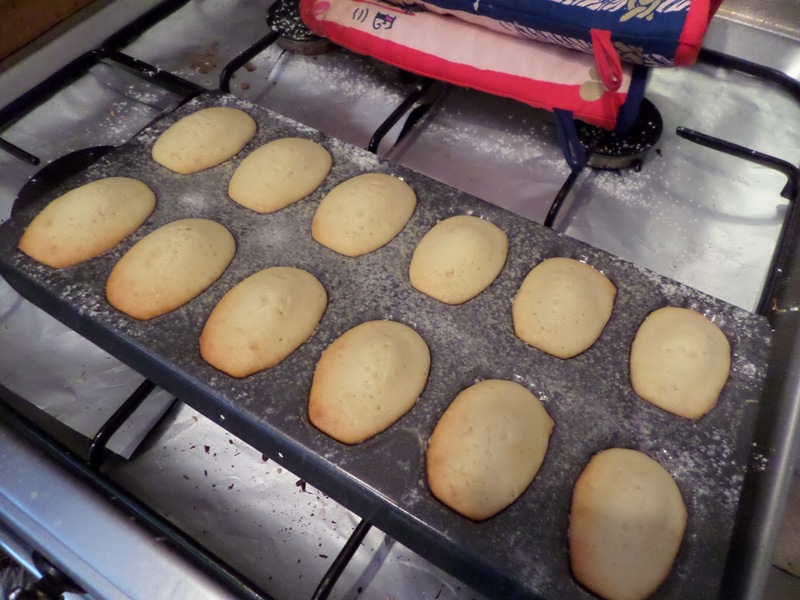 I’ve had my eyes on a Cook’s Illustrated recipe (subscription required) for almond madeleines, however I also got Soph a French cooking book: The Little Paris Kitchen, and it has a very different recipe. The strangest thing about the Cook’s Illustrated recipe is a lack of raising agent: no baking powder or bicarb of soda. Unsurprisingly the French version is richer, using more butter, but it also lets the batter stand for a few hours, or overnight, before using. Normally I trust Cook’s Illustrated, but on this occasion we’re going to go with the local experts and trust the French recipe. 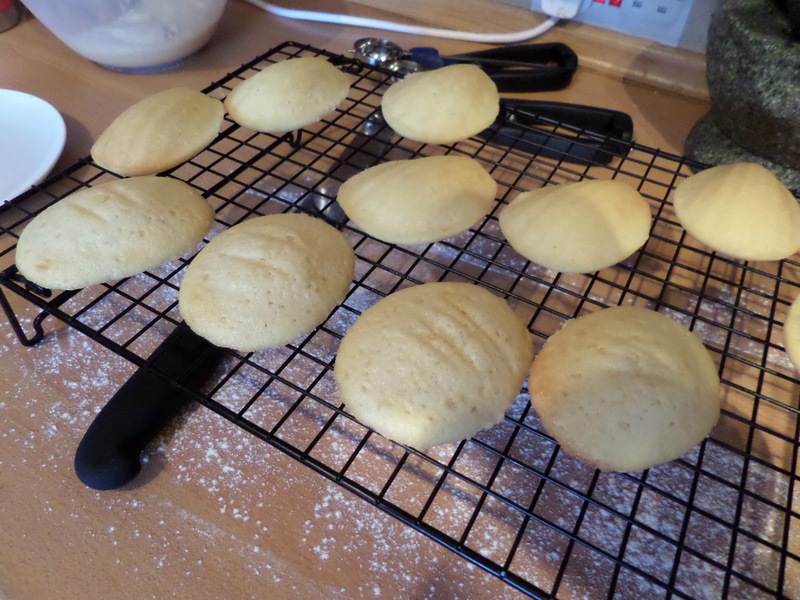 It also doesn’t hurt that the French recipe is for lemon madeleines, and lets us use up more of the lemon curd! Melt the butter on the hob and leave to cool. Add in the milk & honey. Mix the flour, baking powder and lemon zest. Whisk the eggs and sugar until they go pale and frothy. 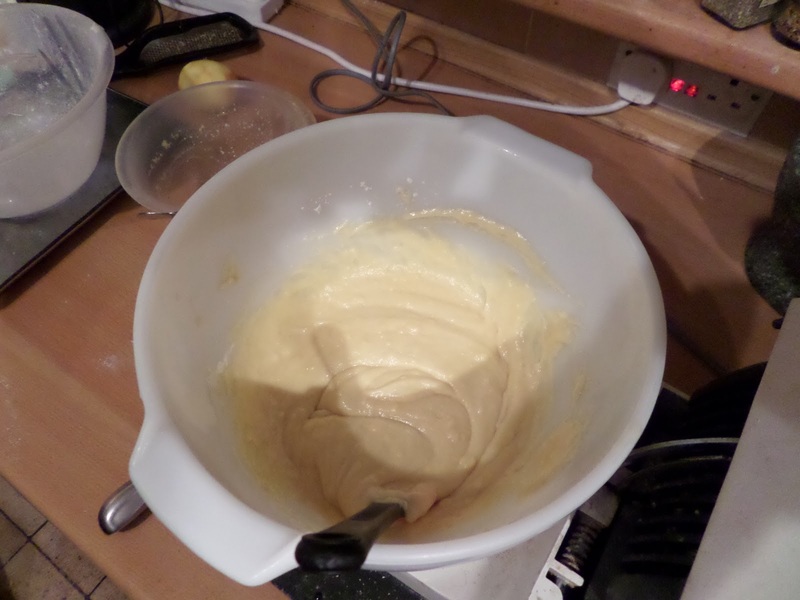 Mix in the butter mixture. Fold in the flour in two batches. Then pop in the fridge over night. 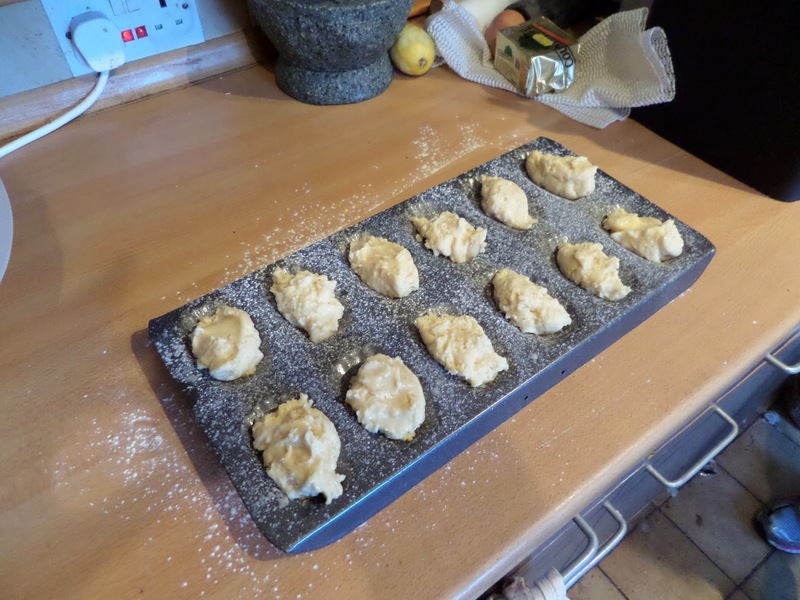 In the morning we sprayed the tin with oil, then sprinkled flour over, and spooned in ‘heaped tablespoons’ into the moulds. We actually did heaped dessert spoons, and the amounts varied hugely as it’s hard to be consistent. Then into a 170c fan oven for 5 minutes, then turn the oven off for 1 minute, then back to 140c fan for 5 minutes (this in/off is supposed to give them their distinctive peaks). However they weren’t nearly cooked, and there was clearly too much batter in many of the moulds, so we put back in for another 5 minutes, and they were still very pale when we took them out. For the next batch we measure out 2 tbsp measures using a cookie scoop, and this looked a lot better, and was much more consistent. They still took a few extra minutes to get some colour on them, but not as long as the first time. We’re not sure that messing about with the temperature is doing much in such a short cooking time. Next time we’ll try just bunging them in at 170c fan for 10 minutes, maybe rotating half way through.